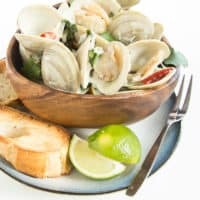 Thai Coconut Clams Recipe | Good. Food. Stories. With the possible exception of lobster rolls, I doubt seafood ranks highly on most people’s list of comfort foods. Steamed lobsters, oysters, sushi, smoked salmon, and crab are considered fancy-pants foods, brought out for splurge dinners, parties, and brunches. Baked salmon and other regular fish fillets are for virtuous health meals. But let’s consider the humbler bivalves—clams and mussels—for a moment, and reflect how supremely comforting they can be. There’s a reason you’ll find rustic cast iron pots brimming with mussels at bistros the world over: the combination of steaming, savory broth and crusty bread for dunking is as warming as being tucked in under a flannel blanket with a duvet on top. It’s one of those meals that’s almost as much ritual as it is sustenance. And though the traditional garlicky white wine broth is a true classic, when my Thai food cravings intersect with my clam cravings, I switch out the wine for coconut milk and make a curry-inspired broth for my bivalves. 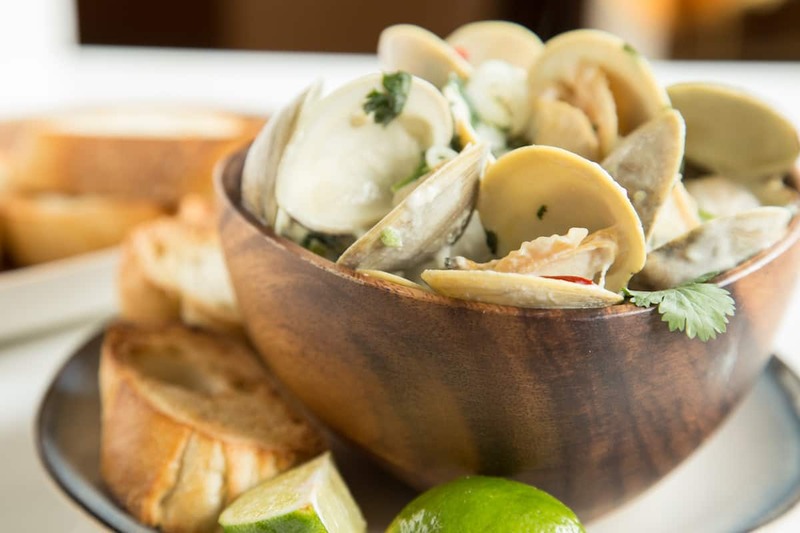 The resulting dish of Thai coconut clams is something that wouldn’t be out of place in the fancy-pants pantheon of seafood, but without the Champagne-wishes-and-caviar-dreams price tag. A dozen clams won’t set you back too many clams, and a can of coconut milk and a baguette don’t cost much more. Everything else can be found in the pantry or the fridge, with the one exception of Thai lime leaves (don’t call them kaffir lime leaves, BTW; that’s a name loaded with racist overtones). Plan ahead and buy a package online now if you don’t have a local Asian market, H Mart, or Whole Foods that carries them—fresh lime leaves freeze exceedingly well, so you can pull out a few at a time and chop them up as needed. 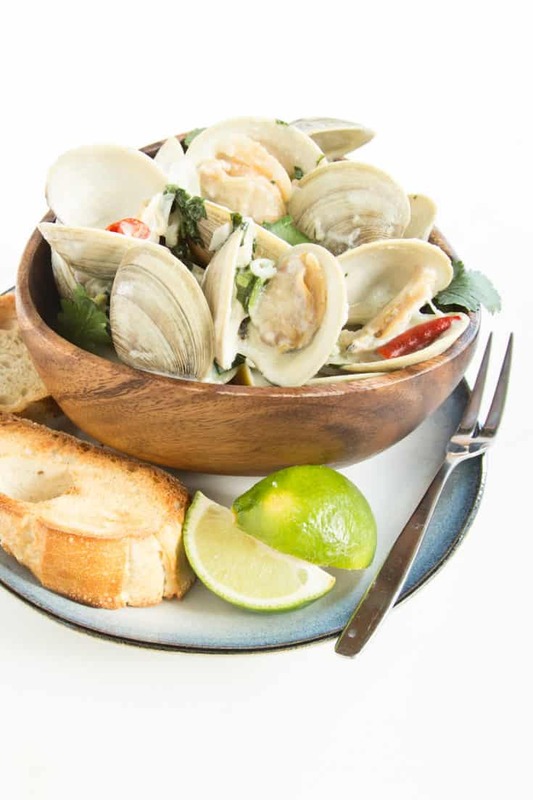 Want to make your Thai coconut clams even more of a meal? Instead of using the broth as a vehicle for baguette slices, soak rice noodles in boiling water while the clams cook. Drain the softened noodles and add to the clams and broth in a large bowl for a slurpable noodle soup. Thai coconut clams simmered in a curry-inspired broth are a whole new kind of comfort food. Serve with crusty bread or rice noodles for a quick meal. Heat the oil in a large, wide skillet or sauté pan over medium heat. Stir in the shallot, garlic, ginger, lime leaves, and chili. Cook, stirring frequently, for 2-3 minutes until the shallot starts to soften. Add the coconut milk and minced cilantro, and bring to a simmer. Add the clams, cover, and cook until the clams open. It shouldn't take more than 10 minutes, but some clams are more stubborn than others. If one or two clams refuse to open, discard them. Divide the clams and broth between 2 bowls. Sprinkle with whole cilantro leaves. 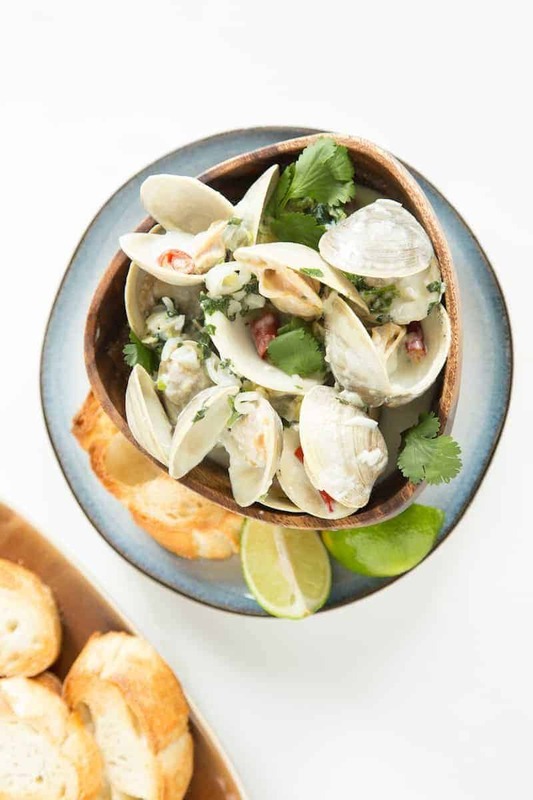 Serve with toasted baguette slices for dipping into the fragrant, flavorful broth, and with lime wedges for squeezing over the clams if desired.